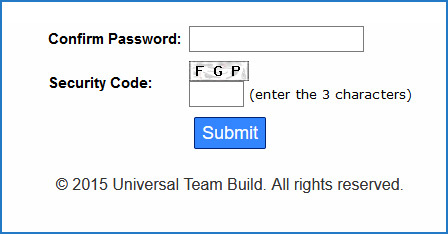 Welcome to the TrafficWave Universal Team Build web site. Before you complete the registration form below, please take a moment to verify that your sponsor's name is shown at the bottom of the page. We want to make every effort to have you join under the person that referred you to this web site. They have worked very hard to invite you here and would greatly appreciate having you as their personal referral. Please compare the two sample images shown here. In the example shown here, the referrer's name is shown. No referrer is shown in this example. Please scroll down to the bottom of the page to see if a referrer is listed. 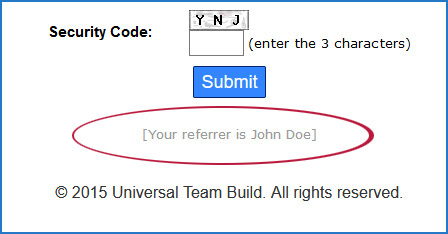 If a referrer's name is shown, then we ask that you please complete the registration form now. However, if no referrer is shown, (as seen in the image on the right) then we ask that you please click the link below. This action will assign you a sponsor and take you to our home page. Simply click the Register link in the top menu to return to this page. You should then see a referrer listed at the bottom of the page and can then complete the sign up form. Our system is designed to help our members so please do not join without a referrer. Click this link only if NO referrer is shown at the bottom of the page.